Readers of There There: A Novel seeking engagement for all reading groups can gain further insight with this essential resource as a guide to aid your discussions. 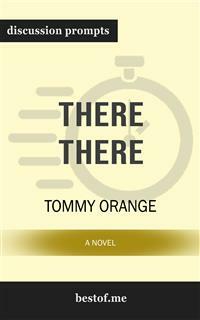 There There is the New York Times bestselling book of author Tommy Orange. This groundbreaking book poses the question, "What does it really mean to be an Indian? A native American? American Indian?" There There follows a unique case of teenagers and elders who ask this question in light of the complexity of the modern world. Orange's characters live in the urban Oakland, California. This novel explored the many different ways of being an Indian. More importantly, ways of feeling like an Indian. Their detachment from tradition, their fractured families and the hustle and bustle of life in Oakland, make their identity as Indians even more elusive. In this comprehensive look into There There: A Novel, you'll be equipped to prepare with the following: Discussion aid which includes a wealth of prompts and information Overall plot synopsis and author biography Thought-provoking discussion questions for a deeper examination Creative exercises to foster alternate “if this was you” discussions And much more! Note to readers: This is a companion guide based on There There: A Novel This is meant to enhance and aid your reading experience, not to replace it. We strongly encourage you to purchase the original book before purchasing this unofficial companion guide. Have you ever wanted to improve your understanding of There There? Or perhaps you are simply struggling to learn the subject matter? It’s a simple teaching technique that helps students learn and readers to grow. With versatile discussion questions for each major criteria regarding There There, these discussion prompts are designed to help surface crucial discussions that are capable to assist toward thinking and learning on a deeper level.